The meeting room at the Ocean Beach Recreation Center was quickly filling up last Wednesday night, the 2nd of January, as the monthly meeting of the Board was about to begin. No “OB-time” here, as the Chair, Jane Gawronski, gaveled the meeting to order right at 6:00 pm. In the audience was a “who’s-who” of the community’s merchant establishment and friends, and it included the heads of the OB Town Council; the merchants’ group, the Mainstreet Association; the local non-profit OB Community Development Corporation. Normally, the monthly meetings of the planning committee may attract maybe half a dozen people, usually either legislative aides and parties with projects before the Board, their friends and maybe a couple of opponents. But this night, it was literally standing-room only in the meeting room of the Thirties era building, with karate classes going on in the center’s gym just down the hall. The “infamous” Police Trailer in the popular OB Pier parking lot. Installed as a “temporary structure” in 1999, the California Coastal Commission issued a Notice of Violation in July 2012. 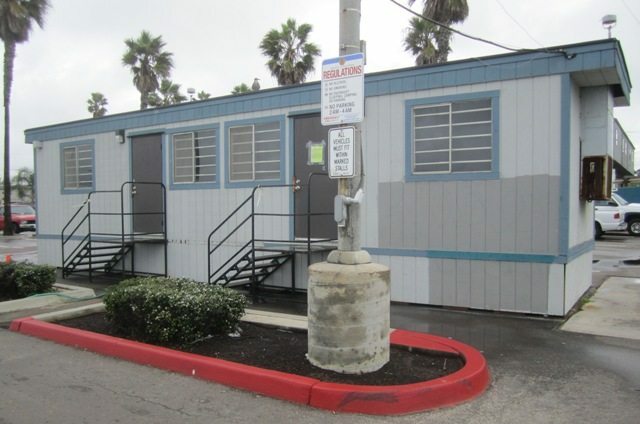 What had drawn all the attention in this small seaside community of San Diego – a village within a city – was the issue of the Police Trailer- a lonely, gray, weather-beaten, old trailer, stuck in the middle of the community’s parking lot down at the beach, next to the famous and popular OB Pier. But the trailer has been a mainstay of the waterfront ever since it was parked there fourteen years ago. Placed there and funded by the local merchants as an enticement for local cops to take a break, fill out their reports, and generally show their presence in an area of the beach that is viewed as most troublesome, the trailer itself has had more of a marked history than originally planned. Installed due to the end of the era of storefronts of the San Diego Police Department – OB had a very visible storefront along the last block Newport Avenue – the trailer represented an agreement between merchants and the police as the most opportune site, as electricity and water were close at hand. But problems with the trailer itself, with its restrooms in particular, and with the police department’s budgetary cut-backs brought the trailer into a state of non-use. In other words, police officers were not using it, and some in the community resented it taking up valuable parking space, blocking public views, and over-using its “temporary” basis. Regardless of how often it is used by police officers – local merchants still believe it is a strong deterrent to criminal activities in and around the pier. And that’s why the Mainstreet Association had mobilized its members and supporters to the Planning Board meeting for this particular agenda item. The California Coastal Commission, which regulates and monitors coastal development along the state’s waterfronts, has jurisdiction over the OB Pier parking lot, and therefore, over any development and or permanent structures within that parking lot. So, the Commission staff, notified by a pissed-off local property owner, cited the trailer for not having the proper permit. Having jurisdiction over infrastructure within Ocean Beach, the Planning Board then gets to give a thumbs up or down to public projects before it. And the police trailer and its future were before the volunteer planners. The City of San Diego had responded to the notice of violation from the Coastal Commission by having the Police Department file for a permanent development permit for the trailer. The Department’s application was before the Board and the cops and the merchants were looking for approval. Yet, OB’s Planning Board was not about to roll over for anyone, especially on such an historically controversial issue as the police trailer. A quorum of Board members listen to speakers for and against the police trailer. Members are elected for 2-year terms. Formed in 1976, the OB Planning Board is a successful experiment in grassroots democracy. Representing a broader base than the local business class, members of the Board are democratically elected at publicly-held annual elections, and therefore, stand-in for all residents – both renters and property owners throughout the small coastal neighborhood of about one mile square. Of its nearly 16,000 residents, six out of seven are renters. The OB Planning Board was definitely an experiment when it first started in 1976 – 37 years ago. It was part of the revolt at the coast that occurred in the late Sixties and early Seventies, a rebellion against unbridled development along the waterfront, development that was damaging the quality of life for thousands who lived there, and for more millions who visited the beaches, cliffs, and waterways of the Southern California coast. This revolt was also part of the mass-environmental awakening that was occurring through out the country in the early 1970’s, and part of the green movement that sprang to life during those days. It was during this period that a citizens’ campaign to install a thirty-foot height limit along the coast was successfully waged. The California Coastal Commission itself was established to protect the state’s valuable public resources. Both just celebrated their 40th anniversaries – the 30 foot height limit in the City of San Diego and the Coastal Commission. Ocean Beach was no exception to the spate of environmental activism. Locals formed a group that went door-to-door to do polling of the neighborhood in its views on coastal development, density and other quality of life issues at the beach. The over-whelming results of this initial poll fueled the motivation for activists for years to come in forming organizations to protect the community. Residents and property owners voiced a tsunami of opposition to the continued unleashed buildings along the coast – and over the next few years, groups working together in the Ocean Beach area gained the authorization from the City to hold a special election for the newly-created OB Planning Board in 1976. The election was held – thousands of people in OB voted and the first Board took its seats. And its been going ever since. The OB Planning Board became, in fact, the very first democratically-elected community planning body in the history of San Diego. There had been other planning groups, but none of them elected from the community they served, but were rather appointed by the business elites to perform top-down urban planning. The experiment in grassroots democracy for Ocean Beach has had its ups and downs. Interest in its proceedings has waxed and waned depending on the cycles of development and recession. For a while, developer interests dominated the Board and an anti-development slate swept the annual election in the early 1990’s. Then nearly a decade later, the very progressive OB Grassroots Organization, also swooped in and swept the elections to the Board and dominated it for the next several years. The Board voted against the Iraq war, and has taken other non-planning issue stances. Even though the Board is democratically elected and acts democratically, it is only an advisory panel to the City. The City’s Planning Commission can – and has – overridden its decisions. Yet, its votes do stand for a lot, and are viewed as representative of the entire village. Lately, the Board has been fighting the City of San Diego over the City staff granting variances to certain property owners who want to demolish a series of one-story duplexes from the Fifties era next to the beach, and construct three-story behemoths way out of character for the local neighborhood. The issue of gentrification has not disappeared, particularly in the vulnerable northwest portion of the community. The Board recently issued an Open Letter to newly-elected Mayor Bob Filner calling for a “moratorium” on the City granting what the Board perceives as improper and even illegal variances to get around the community’s blue-print, the OB Precise Plan. But gentrification was not on the agenda at this meeting of the Planning Board, it was the police trailer. This was the issue that had packed the meeting. All projects that end up at the full board must first proceed through the Project Review Committee, a sub-committee of the Board and chaired by the Board’s vice-chair. The review panel then makes a recommendation to the full board when the issue gravitates to it. When the issue of the trailer came before the sub-committee, a motion to support it in its present location died for lack of a second. The committee did finally make a recommendation for the full Board, a motion to temporarily allow it to remain at the same location but to actively search for a new site. Upset that their favored trailer didn’t get more full support, the merchants mobilized for this meeting where the full Board would take up its sub-committee’s recommendation after a public discussion. The Chair Jane Gawronski, a veteran of past Boards, a 70-year-old retired educator who will be hiking to the top of Kilimanjaro Mountain in Africa in February, introduced a police lieutenant who gave a presentation on the trailer’s history and why it needed to be left where it was. The officer, new to the area, made it seem that unless the Board approved the trailer, it was going up against what the police department wanted. Gawronski then opened up the floor for comments from the audience. The executive director of the Mainstreet Association, the newly-elected head of the Town Council, former members of the Planning Board, the head of the lifeguard union, and others all rose to speak in favor of the trailer. To a person, they all wanted the Board to support the City’s and police efforts to obtain a permanent permit for the trailer for the Coastal Commission, viewing the gray building as a deterrent to the criminal activities – mainly public drunkenness, and drug-dealing that occur in and around the OB Pier. The Board then heard from each of its members as to where they stood on the issue. Some of them bristled at being forced to choose either being for or against the police around the issue of the trailer. As they went around the Board, the opinions were as varied as the community’s. One Board member pointed out that perhaps the community wanted the trailer but wanted it moved to a different location. Another stated the obvious but unspoken point, that the Coastal Commission was interested in issues such as proper permits, the obstruction of a public view, and was the agency driving the need for a permit. Whether police actually used the trailer was another issue raised by Board members. “I spend a lot of time on the seawall,” one member stated. “I’ve never seen anyone enter or exit the trailer.” He questioned the location and asked why the community couldn’t place it elsewhere. Someone else mentioned that the police were not allowed to use the trailer except for its restrooms. Another Board member questioned why the trailer couldn’t be moved under the OB Pier. This caught the police in a contradiction, as they have been saying that the trailer must stay in the parking lot because of all the crime under the pier. But the trailer couldn’t be moved under the pier because … of all the crime there, in so many words. The last Board member to speak raised the issue that he couldn’t see recommending a temporary use to the Coastal Commission. At this point, the Board launched into a discussion of figuring out what motion a majority could support. They discussed having a future police sub-station included in a new lifeguard station that the community wanted and needed – although no plans for such existed. More discussion followed, until a motion was made to approve the permit with conditions, conditions that then took more discussion. Finally the wording was settled upon: – a motion to approve the request for the permit but with an addendum that stated the support was conditional upon and until a more suitable and permanent location could be found. Or words to that effect. It was over for most. The meeting continued for a few more minutes but the issue that had galvanized the merchants had been decided. The police trailer was okayed, but it was very apparent that the Board only viewed it as a temporary thing, once again. The merchants were fairly pleased with the outcome, however, and felt vindicated. Opponents of the trailer – except for one – had not materialized, as the issue of “creeping Big-Brotherism” feared by the community’s radicals more than a decade earlier, had not shown up. The City and Police will proceed to make it permanent, and the trailer itself will probably get a new paint job, a new police seal, new curtains, and a renewed sense of worth. Whether police officers actually use it will be seen. 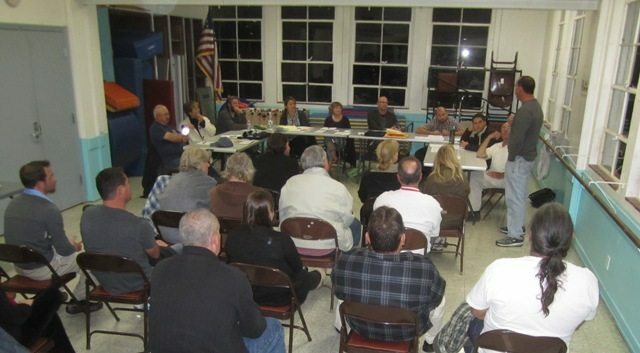 But the experiment in grassroots democracy at the Ocean Beach Planning Board goes on. As the recession fades, more projects are expected to come before it, as developers and home owners set to expand on their projects find optimism in the new year. And hopefully, locals will continue to support the volunteer planners, participate in the upcoming annual elections, and keep the experiment alive. Real democracy takes patience. The city and the citizens would benefit by co-locating the police sub-station with the lifeguard facility. A combined asset can provide more services at a lower cost to construct and operate. And, with bond monies currently available to parks/recreation and the special funds for law enforcement, combining the two would see a stream of funding to help make it happen. The trailer just adds to the homeless look of the OB pier parking lot. We can do better. The city’s code enforcement director wrote a report in 2010 stating the trailer was temporary? and did not require a coastal development permit ? corruption or just plain stupidity? who knows ? that forced the issue to go before the coastal commission for clarification, after two years they never answered the question directly, THEY ( the coastal commission) complained to the city and issued a violation. Repeated requests for a simple letter from the coastal commission stating the obvious would have been enough information to bring it before the O.B.P.B. We can do better than a trailer in the middle of a beach parking lot for our police officers, the organization that pays for the trailer is the Ocean Beach Mainstreet Association it is made up of 525 local business & commercial property owners, at least 20 of them attended the planning board meeting, it’s a shame NOT ONE is willing to provide a 10′ x 10′ office and a restroom ?, yet they find it easy to take parking spaces from their own potential customers, create blight & block one of the best views of the surf in Ocean Beach ? Lt. Stone argued that the trailer needed to stay in the EXACT location or nothing ? this bully is not speaking on behalf of S.D.P.D. she is a puppet for the O.B.M.A. in an S.D.P.D. uniform. Police will respond in a timely manner with or without a trailer. Jan. 3rd the day after the planning board meeting Asst. Chief Long & others walked the parking lots and where shown various alternate locations with existing water and power, the chief agreed that all locations would be considered regardless of what Lt. Stone says. The safety of this community will not be held hostage by the demands of one cop & the O.B.M.A. The Ocean Beach Planning Board and it’s members are doing a great job of balancing the needs of both residents and police……it helps when people tell the truth and are honest about ALL options.